Type each of your Player’s NAMES and Jersey NUMBERS on these Basketball Mugs in the White or Stainless Steel Travel Coach Mugs or choose one of the many Ceramic Mugs for cheaper basketball coach gifts. Any parts of any of my designs can be placed on any of the hundreds of personalized Zazzle gifts. Call Linda to make changes or to create a new and cool personalized basketball coach gift. 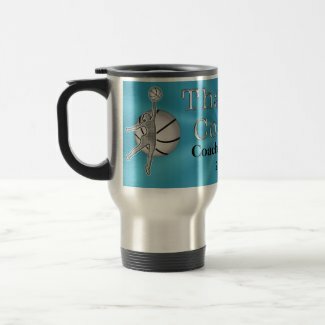 Unique Vintage Basketball Coach Gifts with his NAME and YEAR or type in Your Text, Team Initials etc. Say Thanks Coach for all of their hard work and time and dedication to creating a great team. Give a gift he’ll remember that will last for years and years. I personally own and love this mug. The lid turns to close, it fits nicely into cup holders and the best thing of all is it is Stainless Steel inside as well as outside. If the stainless steel mugs are currently out of stock, you can purchase them in the (White Coated Over Stainless Steel Mugs). The White Coated Mugs show off the Color on Designs strikingly. 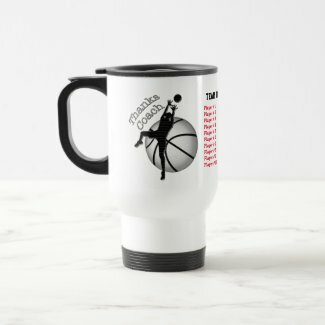 The old antique paper background, around the middle of the mug above, has been a real hit on other gifts I’ve designed, so I decided to put it here on these cool basketball coach gifts. You can also select white ceramic mugs to design with accent colors. Great gifts for basketball coaches because you personalized it just for them. Stainless steel on the inside too instead of plastic. I love that about these mugs Zazzle prints on. 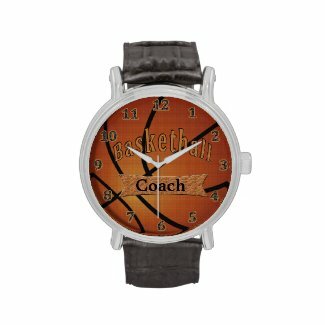 PERSONALIZED Basketball Coach Gift Ideas PERSONALIZED with their NAME, the YEAR or Team Initials or Your Text. Just Type in the Coaches NAME(S), YEAR and or TEAM or SCHOOL Name., as text boxes are available. Change or Delete any of the temporary text. Great Basketball Gifts for that special coach. Original gifts created by Little Linda Pinda Designs. Two more of our super popular Basketball Coach Gift Ideas. Great Gift Ideas for Basketball Coaches at Christmas or for any special occasion. The first one is a Vintage Basketball Watch for the Coach. Cool Antique looking basketball with a black vintage leather watch or choose another style. This is our best selling watch style for men. The second gift is a TEAM Photo Basketball Mug for Coaches. Your coach will love their own Personalized Basketball Coach Gifts all year. Instructions to add your team picture and a place to type in your coach’s name and the year or your special words for your coach. If ordering more than one Personalize Coach gift, personalize it (one at a time), then place it in the (add to Cart Button), then go back to personalize the next basketball gift for any other coach you might want to honor. 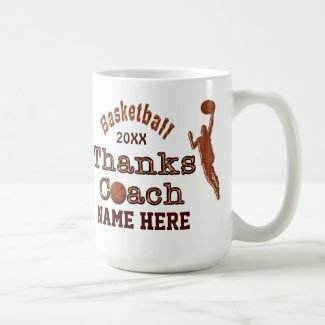 Really cool Basketball Coffee Mugs for Basketball Coaches with their NAME and YEAR is one of our most popular basketball coach’s gifts. Quality inside and out. I love the stainless steel lining vs plastic. The lid turns and is spill resistant. I own a Zazzle mug and love it. I am proud to show off the amazing detailed printing, but more than that, I love the quality of this mug, especially the stainless steel inside. Also, Available in Stainless, as shown and White Stainless Steel on the outside with stainless steel on the INSIDE, If you are concerned, like I am, about drinking from plastic mugs, then consider a Zazzle personalized mug for coaches. Your coaches will love seeing how much you appreciate them and will cherish these Cool Coaches Gifts for a lifetime. One of my most Popular Basketball Coach Gifts. You can actually Type the Coach’s NAME instead of “Coach” or Type YOUR NAME, Team or Whatever you wish. What a memorable gift this will be for anyone who loves the game. Great Gift Idea for that special coach. Choose a different style Watch, such as the Stainless Steel Basketball Watches or the Two Tone Players or Coach Watches, etc. 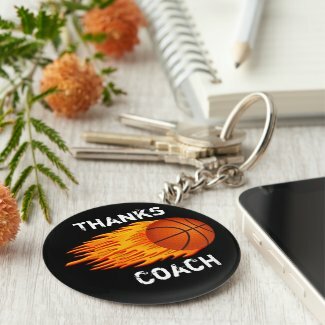 Unique Basketball Coach Gift Ideas. 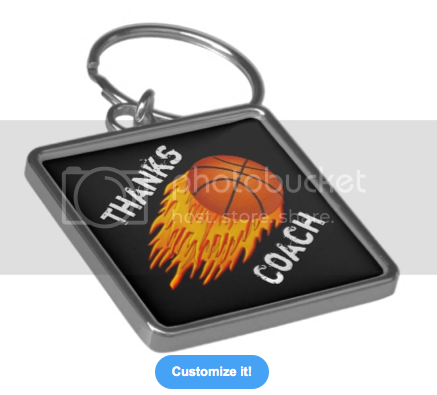 Very special Gifts for Basketball Coaches can have a PHOTO Uploaded by Clicking the tiny blue word “Change” located underneath the “Personalize it” area on the Product’s page. Most of the picture areas area carefully proportioned for a 6 inch X 4 inch Horizontal Photo (or Vertical image when applicable. To Change the Existing Temporary TEXT, Type YOUR TEXT in the TEXT BOXES, also located beneath the “Personalize it” section on the product page. Really cool and Customizable Basketball Gift. After clicking on a product, you will be brought to the Zazzle product. On your right, you will see the “Personalize it” area. Under that is where you can Change the Temporary PHOTOS or Temporary TEXT. Personalized Basketball Coach Gifts. If you wish to Move or Re-Size an image, Click the “Customize it” Blue Button. Click on YOUR NEW Image on top of the product and Dotted Lines and tiny Gray Boxes will show up (or select the image LAYER to your right Under the “Customize it” area to Select YOUR IMAGE. Now you can drag the gray boxes in and out to resize the your pictures. Click the tiny blue “Change” word below the Temporary Image and follow prompts to “Upload New Images” and choose your image from your computer. You can also call Linda and send your photo to me and I will happily upload it for you making basic Photoshop adjustments if you wish, at no extra charge. You will see it before you decide to buy it or not. No obligation. Pretty Women’s Gifts for Coaches Basketball Mug with her NAME and YEAR typed into the Template Text Boxes. Pretty and popular Turquoise background with a metal like “Thanks Coach”. Cool Silver Techno Basketball Player Girl/ Woman in a Layup shot with a Silver Basketball. Basketball Coach Gift Ideas for that special coach. Customizable Basketball Keychains with Coach’s Name. If you are looking for Basketball Gifts for Girls, here is a really cute idea for Basketball Decor for Girls Bedroom. Personalizable Gifts for Cool Basketball Bedroom Decor. See both the front and the back of the pillow as there is a different design on each side. Silver Basketball with Her NAME and JERSEY NUMBER typed into the Text Boxes on the Front and some have a Silver Techno Basketball Player in a layup shot on the back. You can even change the background color. See instruction in the article. Perfect Basketball Gift for the coach. 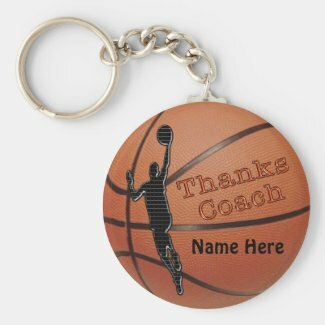 You can choose this inexpensive personalized Basketball Keychain (under $4.00 Retail) or choose another more expensive style. The cheap Basketball keychains can also be bought in Bulk for the entire team, with each team player’s name and number individually customized for them, at no extra charge. 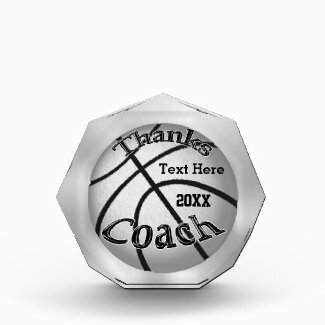 For multiple different names and text, Click “More” to see ALL text box templates which is located beneath the “Edit this design template” to the right of each basketball keychain. Just type in the text into each text box template or delete some or all of the text. You can also type in the same text for all key chains so you don’t have to individualize them. Premium Silver Metal Basketball Keychains available in Round and Square. Once you are on the product page, look to your right and scroll down to the “Style and Size Options” and click on each size and style to see how it looks and see the price. Here is what this same Keychain looks like with the more expensive Premium Metal Silver Finish Large Square Flaming Basketball Thanks Coach Gifts. Basketball Team Gift Ideas. This Large Premium Square Keychain Retail Price is over $20.00 where as the one above is less than $4.00. Look for the Zazzle Sales too. The coach will love the flaming Basketball Design. Really cool Thank You Gift Ideas for Coaches that are Customizable. 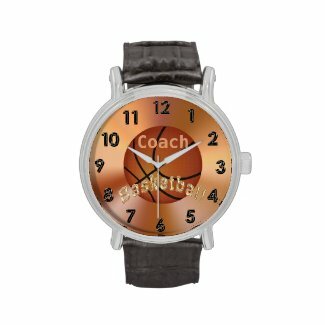 If you are looking for a really special Personalized Basketball Gifts for Women, I just created this Women’s Coach Watches. You can change the Background Color if you wish. See the Instructions in the Product Description area. Type your Coach’s NAME in the TEXT BOX. Choose a different Style and Color Watch too with various price points ranging from around $50.00 to $100.00. This watch style is just over $50.00 but watch for sales. Not just Basketball Coach Gift Ideas. Super Gifts for Coaches Basketball that they will cherish. 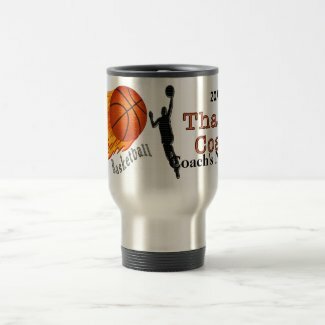 Cool and unique Gift Ideas for that special Basketball Coach. Unique Basketball Watch with soft vintage leather band. If you wish to ADD your Coach’s NAME, Click the “Customize it” Button, and to your right, Click the Tiny Blue “Add Text” and then Type in YOUR TEXT or COACH’S NAME in the Text Box. 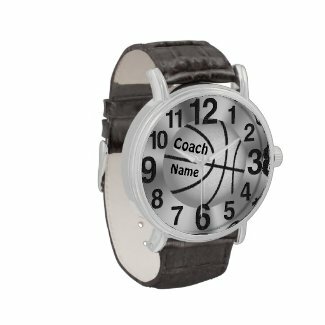 Watches for men, boys and basketball coach gift ideas were a real hit at the End of Basketball Season Gifts for coaches. Thank you so very much for choosing our designs. I am so honored and grateful. 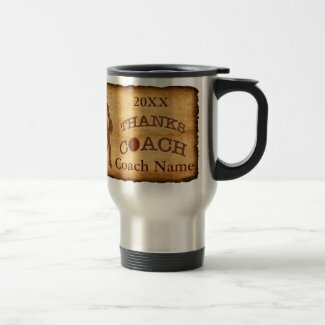 Personalized Mug with YEAR and Coach’s NAME typed into Text Box Templates. I created this Personalized Coach Gift with more masculine colors and men basketball players in a layup shot. Basketball Gift Ideas for everyone that loves the sport. Click the image or the link to see ALL views of this Coach Stainless Steel Coffee Travel Mug available in a White Stainless Steel Exterior and Stainless Steel Interior or lots of different Ceramic Coach Mugs, some with accent colors too. 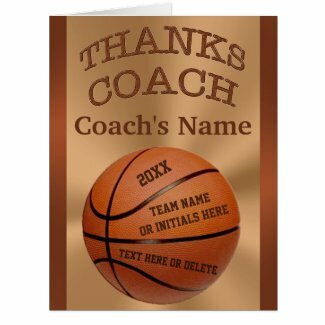 So many cheap and moderately priced Personalized Basketball Coach Gift Ideas including GREETING CARDS too. One of my customer’s husband told her that the best gift he ever received was a personalized coach gift. She was so kind and excited about seeing our personalized gifts. She requested some design changes for which she ordered and received in about a week, quicker than she thought. She was so pleased with the fact that I customized the design for her and how the premium keychains turned out that she actually called Zazzle to tell them how happy she was with the keychains and she was so nice to add how kind and accommodating I was to her. She even took the time to write back and tell me all of this and was so grateful. These type of comments keep me going. Thank you so much for taking your time to let me know how much you LOVE your Zazzle merchandise. Here is my Category for ALL Basketball Stuff for Players, Coaches and Fans, Men, Women, Boys and Girls. These very cool Gift Ideas for Basketball Coaches are affordable, quality and will be gifts they remember for many, many years to come. Some coaching jobs are totally voluntary and some get paid a marginal amount. One thing for sure is that most coaches are passionate about their team and and forming not only a great team of not only winners but also winners in life. Coaches play a big part in molding your children’s discipline, dedication and passion for their favorite sport. This discipline the coaches teach our kids will stay with them for a lifetime. Personalized Basketball gifts to coaches from team. Getting your children involved in sports builds character. The discipline and values will be with them for life. My son was a football player in High School and College. Even though he wasn’t as big as most football players, as a college freshman, he was still chosen as a start up and chosen for the travel team. It is scary for parents to see their kids in contact sports. Even though I would have preferred that my son play in a less aggressive type of sport, I still had determined early on that I would allow them to choose the sport they were passionate about. My son played a little baseball but football ended up being his passion. Basketball Coach Gift Ideas will be a gift they will cherish for many years. You are not only showing your appreciation but you are making a memory and not just purchasing a gift off the shelf. You are giving Unique Basketball Coach Gifts that are original designs and customizable and personalized by you. Show your appreciation and say Thanks Coach for a job well done. I hope you enjoyed the Cool Basketball Coach Gifts by Little Linda Pinda. Thank you for helping my little design business grow. I can’t tell you how much I appreciate it and I love it that you love the designs. Feel free to call me with any requests or any changes to any of my designs. I can place these on any Zazzle product too. By personalizing your basketball coach gift, you are giving them a memory they will love to share with their friends and family. It will be one of the most meaningful gifts basketball coaching gifts they’ve ever received.